Debate: The New SAT Prep? This article excellently explains why and how debate teaches all of the necessary skills that the SAT is meant to cultivate. Just another reason why debate is awesome. I also really like this post about debating. The author definitely has a really good explanation of how debate should occur. 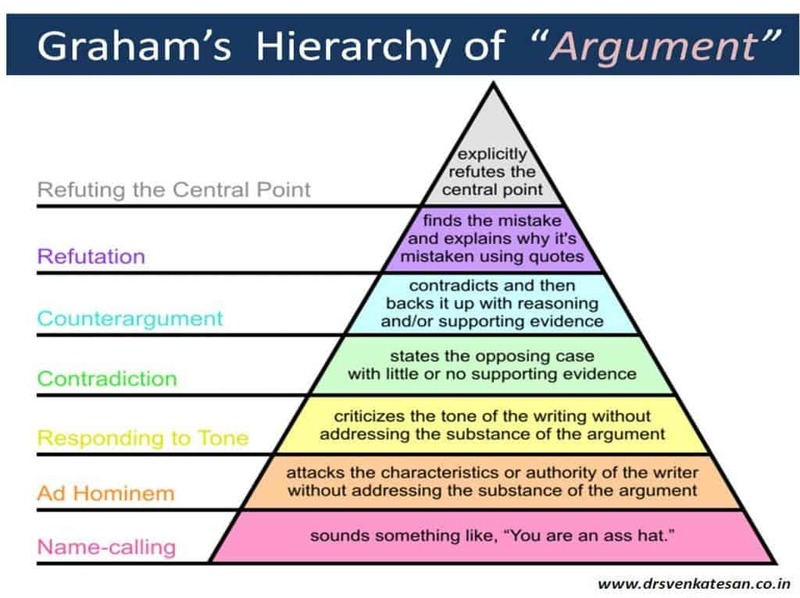 I think this is a really good explanation of how people should debate. Guess which two tiers of the pyramid I’m sick of seeing. So, I’ve noticed a rather upsetting trend lately as I followed some of my favorite personalities online. It seems that few people know the etiquette of debate. Now, this is not focused on anyone person. This is a problem that has sprung up on many occasions with many people. I don’t want this to feel like an attack on people. This is a legitimate plea for civility among intelligent people. I think most of the problem can be traced on the focus of debate. Far to often when civil debate goes awry, it seems that the conflict is focused less on the topic brought up and more the person who brought it up. If you’re someone who is interested in networking for your future career, would like to develop your public speaking skills, or want to increase the impressiveness of your resume, then the debate team is for you. One of the most difficult things for high school and college students to do is think on their own. We’re taught to always follow the instructions and do things like listen to authority figures. Even when we’re told to think outside of the box, we’re told to not get too far outside of it. For me, debate was the one thing that really taught me to get as far away from the box while thinking as possible; it taught me how to think for myself and how to think critically about any issue that occurs. I think the reason for this is the fact that debaters are forced to switch sides on a position depending on the debate. For example, I have defended that warming is real, anthropogenic, and will cause total extinction of every living thing on this planet one debate, while defending the exact opposite in the next debate. I have argued that American power projection is the best thing ever and the worst thing ever. I have argued that the capitalist system of production is the best economic system and I have argued that it is the worst economic system. The fact that a debater is forced to critically think about sides of a given topic means that s/he is forced to understand that there are merits to both sides of almost every single argument. Being exposed to the sheer amount of arguments on each side of a position really opens one’s mind up. While there are some downsides to hiring a debater for a law firm (we’re often told to slow down), debaters seem to make the best lawyers. While this article doesn’t draw this conclusion, I would certainly think that the various logic-oriented skills this law review discusses would be a positive trait for any employee. Debate definitely trains students to be excellent in the work force.